Ducati vs. Ducati vs. BMW vs. Ducati – a 1979 Comparison. During my short AMA Superbike career I raced Dale Newton’s Ducatis in 1977 and 1978 with some success. In 1979 Dale could not participate and I rode the San Jose BMW, one of the original Butler and Smith bikes that dominated the inaugural 1976 Superbike race season. I thought it might make an interesting story to compare the different racing Superbikes. I raced three different Ducatis during 1977-78, and they had very different engine characteristics. The chassis of all three were basically the same but the motors were quite different. I’ll describe the chassis first. The stock Ducati SS frame was superb. The only thing Dale Newton, my sponsor, did to his bikes was to trim off all the street-based brackets and the area along the bottom of the frame that held the center stand. The frame was very strong — it did not flex, period. Because the L-twin motor was long the frame had a rather long wheelbase and the fork angle was larger than you would like for a race bike. As a result the bike was very stable at high speeds but didn’t do so well in tight turns. Very few Superbikes of that time could match the Ducati corner speed in fast sweeping turns. At Sears Point, for example, the bike could do turns nine and ten sweepers really fast, but I could never get a good late-apex line through the tight turn eleven hairpin. Like just about everyone else in the class we put on wider-than-stock Morris magnesium wheels and ran with racing slicks. Dale and I used Goodyear slicks while others ran Dunlop slicks on their bikes. The Ducati was stiffly sprung – both forks and shocks had pretty stiff springs. This helped with the stability but really pounded you if the track was bumpy. I found it best to traverse the rough parts of the track on my toes, with my rear slightly off the seat. I would use my knees as extra shock absorbers, letting the bike move up and down beneath me while I stayed steady. The stock header pipes would ground out in the turns so we fitted high-rise headers that matched the pipes that came in the race kit from the 750SS. The Ducati SS models came with high mounted rear-set foot pegs and controls, clip on handlebars and a half-fairing. Once the race headers were installed there was a generous amount of ground clearance and nothing dragged unless you got really extreme. 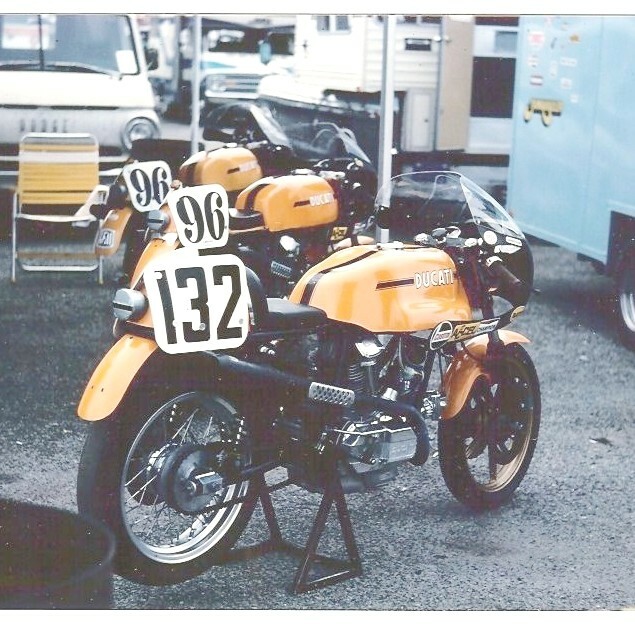 About the motors: I had the privilege of racing three different Ducatis – the 1977 Sears Point winning bike, a bike with the motor Cook Neilson and Phil Schilling developed, and Dale’s 905cc bike. We called the three bikes “the Stocker,” “Cook’s bike”, and “the 905,” respectively. The three different Ducatis all in one place at Laguna Seca in 1978. From back to front are the 905, Cook’s bike, and the Stocker. The Stocker is set up for Mark Homchick to ride. The Stocker had Imola spec camshafts but only slightly modified inlet ports and stock exhaust ports. It had stock bore and stroke giving an actual displacement of 864cc. The motor had a lot of torque and could really jump out of the corners but ran out of breath around 7,800 rpm. I generally would up-shift before getting to 8,000 rpm. Cook’s bike was developed from a 750SS. It had less torque and gained speed more slowly, but kept getting faster as the revs rose, all the way to 9,000 rpm. The stock 750cc motor was bored to 883cc and had highly modified and enlarged inlet and exhaust ports done by flow expert Jerry Branch. Other than the motor characteristics the bike was similar to the Stocker and handled really well. Cook’s bike was clocked at 150 mph; the Stocker was never clocked but I believed its top speed would be in the 130-135 mph range. The 905 was something else. It had both torque AND top speed, making power all the way up to 9,000. It felt like the Stocker until the revs got to 8,000 rpm when it began behaving like Cook’s bike. Branch had done the ports for the 905 and its top end speed showed it. At Laguna Seca in 1978 the 905 finished a close second and set the Superbike lap record. The BMW was very different. The motor was wide, with the two cylinders sticking out the sides that caused ground clearance problems. Shorter connecting rods were fitted and the cylinders trimmed, and the motor was mounted high up in the frame. Udo Geitel made a lot of changes to the bikes he developed for Butler and Smith in 1976, and the motor was surprisingly strong. There was a generous amount of torque and a wide power band, with kind of a rush as the throttle was opened that last one eight of a turn. I was surprised to learn it had a four speed gearbox, while the stock BMWs had five speeds. I was told that even though the five-speed fit in the cases it was “a bit delicate.” I found out that’s BMW-speak for “it breaks.” The motor had a wide enough power band that it didn’t really need the five-speed gearbox. Me and the BMW at Sears Point in 1979. This might be turn two. Photo by Ken Mullins. The bike had great brakes, with much better feel than the Ducati brakes. I remember during the first test session doing a “stoppie,” lifting the rear wheel off the ground during braking for turn eleven at Sears Point. It was my first stoppie ever, but it was so controllable I recall calmly thinking the rear brake isn’t going to help much here. The suspension was extra long, to help with the ground clearance issue, and much more softly sprung than the Ducatis. There was a lot of dive in the front forks under braking. The shaft drive effect lifted the rear end under acceleration so it was important to be on throttle during a turn to avoid dragging the cylinder heads. No trail braking with this bike. We had trouble with the handling over bumps. When the bike hit a rough section of track while on full throttle the handle bars would start whipping back and forth violently, and it would increase until I backed off the throttle. It was, frankly, scary. The bike had a fork dampener and we tried cranking that up to max. We tried different weight fork oils, different fork springs and different amounts of pre-load of the fork springs, but none of that helped. 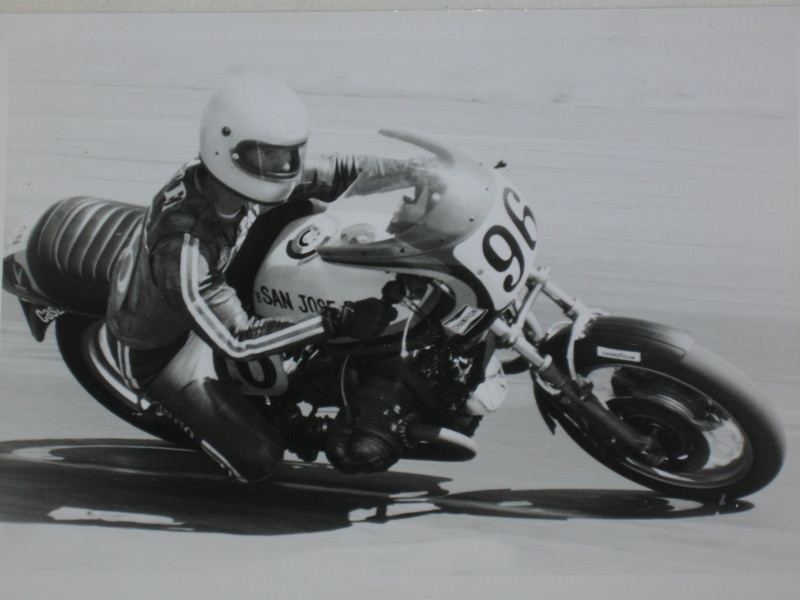 I raced the 1979 AMA Superbike season on a bike that couldn’t use full throttle where there were bumps in the track. I’ve since read more about setup, and how important it is to get the right setup. I now think our problem was actually at the rear of the bike, not the front. I mentioned that on full throttle acceleration the shaft drive lifted the rear end. When the bike hit a bump and compressed the shocks, the springs and the shaft drive would extend the suspension so it rebounded too hard. This would cause the rear wheel to bang back onto the track which made it bounce, compressing the shocks again. Repeat the process – compress, rebound, bounce. This repeating kept up as long as the bike was on full throttle. But it didn’t just bounce up and down. If the bike was a little off vertical the bouncing would start going side-to-side as well. The side-to-side bouncing would increase in amplitude on full throttle, and this movement of the rear translated to the front and caused the handlebars to flap back and forth. It would continue this vicious cycle until I backed off on the throttle. I think the solution would have been lighter rear shock springs and/or increased rebound dampening. None of us really knew much about setup in those days. My experience with the Ducatis didn’t help because they just worked, no matter what things we tried. It’s too bad we never figured it out. The bike had a good motor and really good brakes. I would have had to change my riding a bit to handle the different suspension, but if it hadn’t been always trying to kill me I think I could have had some fun with it. Overall, the Ducatis handled better. The BMW had much better brakes than the Ducatis. I’d put the BMW motor comparable to the Stocker, a wider powerband but slightly less top speed. The BMW could out-accelerate Cook’s bike but if there was a long straight or some fast sweepers on the track Cook’s bike would slowly disappear from the Beemer. The BMW turned more quickly than the Ducatis and had an advantage on tracks with lots of tight hairpin turns. The 905 would soundly beat the BMW everywhere except the hairpins. Great article. We race BMW’s in Australia for many years in Post Classic racing. Bikes are fairly modified, running methanol @ 14;1 comp. Handling is not an issue with additional frame strengthening, ohlins shocks and good fork internals. Quicker than Ducati 851 down the shoot. Pity there is not enough BMW’s out there racing these days.